Eat Turkey ... Whenever! The other challenge revolves around attitudes toward turkey. “I’d like to get people to realize that turkey isn’t just for Thanksgiving … hopefully trying to get some local restaurants to do some turkey in the spring,” says Wheeler. Wheeler is as thrilled to share one of her turkeys with Waters, (whom she met at the recent Kentucky Harvest Festival, presented by Slow Food Bluegrass and The Sierra Club in Crestwood, Ky.) as she is to share her passion for heritage breeds and local food with her friends, neighbors and others beginning to engage in the local food movement. Their deliberate farming adventure began with the two horses they brought with them, ten baby calves and a cow. After a few visits to the Leitchfield area farmers market, they acquired laying hens, pheasants and four young turkeys. Wheeler admits to playing favorites with her farm animals. The chickens were her first choice to raise on the farm--and she still raises USDA-certified Cornish Rock Cross--but she soon realized it was the turkeys that charmed her. “He wanted to know if I had turkeys to sell,” she says. Williams' call was the start of yet another business venture--providing food to local chefs. 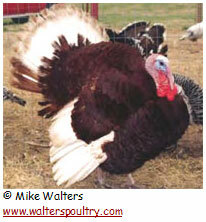 In the spring of 2006, Wheeler raised 25 turkeys for Williams, most of which he prepared and sold ready-to-eat to customers. This past spring, she raised 70 turkeys. Twenty-five went to Williams, her boss bought 10 and several more have been order over the phone. She says she has about 20 more left to sell (as of October 9).